GAIN Capital reported its third quarter earnings last Thursday. Bottom line net income was $4.7 million ($0.12 Diluted EPS) on revenue of $60.6 million (second highest all-time). The figures were up 42% and 52% respectively from the same period last year. The financials though were below Q2’2013 report of $73.0 million in revenue and $17.2 million in net income. Attributing to the year-over-year growth was the inclusion of GFT’s US customer base which GAIN Capital acquired at the end of 2012, increased industry volumes, and growth in the broker’s GTX institutional business. On a quarterly basis, revenues were affected negatively by a 15+% decline in retail and institutional volumes, while net income was hit by rising expenses. Also occurring during the quarter was GAIN Capital finalizing its acquisition of GFT. 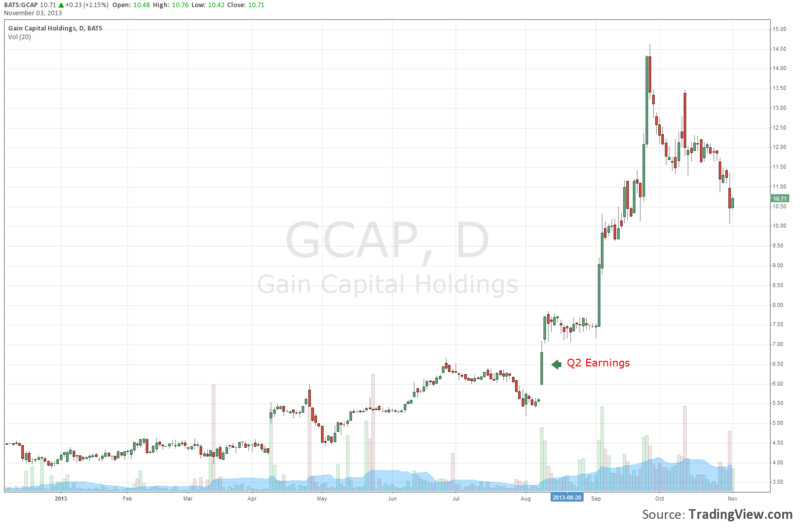 Following the broker’s Q2 surprisingly strong results, shares of GAIN Capital (GCAP:NYSE) rose from $5.50 to $7.75, before ultimately rallying to an all-time high of $14.56 on September 25th. Before reporting on Thursday, prices closed on Wednesday at $11.25, and have since fallen 4.8% to a recent $10.71. Taking a closer look today, we analyzed what led to the higher expenses, revenue quality, and GFT’s future impact. $121 Revenues Per Million (RPM) – When reviewing GAIN’s earnings last quarter, RPM were the primary factor in the broker’s successful report, as it factors the amount of revenue captured per million dollars of retail volume traded. In Q2, RPM was reported at $120 and had grown from just above $80 in Q1. In Q3, RPM stayed strong at $121, even as volatility had subsided. Although lower volatility is often linked to declining profits for market makers, Q3 data has so far shown to be bucking this trend. In the Q3 US FX profitability report provided by Forex Magnates last month, it showed that retail accounts had been less profitable compared to Q2. Possibly leading to the decline in profitability was an overall industry increase in new accounts during the first half of 2013, as volumes and interest in the asset class among retail clients rose. In terms of the future, during the firm’s conference call, CEO Glenn Stevens steered analyst focus towards the trailing 12-month average of $101 RPM, rather than on the current quarter’s $121 figure. This follows similar statements in Q2. As such, GAIN themselves isn’t expecting RPM to continue to be as strong with $100 as their main long- term target. Commission business – Including both GAIN’s, GTX institutional FX unit and futures broker, Open E Cry (OEC), overall commission revenues grew to 21% of the broker’s totals from 19.5% in Q2. GAIN Capital has publicly stated its interest in diversifying its revenues away from retail forex, with their ultimate goal of reaching 50/50. During the conference call, CFO Jason Emerson, related to that of the year’s total in commission revenues, $16 million was from OEC. As a result, the GTX portion for 2013 is around $21.8 million and composed 11.5% of the broker’s total revenues. At $2.9 trillion in GTX volumes this year, this calculates to $7.5 RPM, which is at the mid to higher end for similar ECNs. In the call, Stevens mentioned that their pipeline of GTX leads was strong, but the conversion process takes up to a year, with GAIN being at the mid-point with these potential clients. The takeaway is that Q4 GTX volumes are likely to track the overall institutional FX industry, without seeing meaningful growth until at least the middle of Q1 2014. In addition, due to the very competitive institutional liquidity market, GTX’s RPM may experience contraction as they compete for new business. GFT – GAIN Capital completed its acquisition of GFT on September 24th with only four days of GFT’s financials included in GAIN’s Q3 report. For this period, GAIN reported GFT’s contribution of $2.8 million in revenue with $0.7 million of EBITDA. For the year, GFT has shown $88.2 million, and negative EBITDA of -$6.9 million. The negative EBITDA figure for the year occurred even as it was positive for the first half of 2013, suggesting a ‘very weak’ Q3 at GFT. As GAIN Capital continues to believe that it will capture 75% of a possible $35-45 million in annual synergies, GFT’s losses were questioned during the call. Stevens attributed the declining profit on the effects of the acquisition hanging over GFT’s operations, and concluded by stating, “Frankly I’m not going to sit here and defend their operation because I didn’t run it back then, me and my team run it now.” Looking towards Q4, GFT is expecting to see the combined firms’ report of $90.4 million, based on the performance of the first nine months of the year. Bottom line, the success of this deal will lie in how much of GFT’s partner business GAIN Capital can retain. According to GAIN, partner-based volumes were 37% of retail OTC activity and with GFT now, accounts for 50%. Anytime you have such a deal in the industry occur, it puts existing affiliates, introducing brokers and white labels into play. If we see this figure drop back to the low 40’s over the next six months it will indicate that GFT’s partners are sending the combined broker less business. Expenses – As mentioned above, expenses during the quarter rose from Q2, even as revenues fell. Emerson attributed the increased trading expenses and commissions to an increase in fees for partner-based volumes. In addition, they expressed there was a $2 million in non-recurring partner fees, which may have been paid to retain business from GFT’s affiliates. There were also merger closing costs that were registered during the quarter. Looking ahead, expenses as a percentage of revenue may increase over the near future as GFT partner fees hit the books for an entire quarter, but are expected to decline as merger synergies and cost reductions are put in place. Conclusion – There is no questioning that shares of GAIN Capital have had a nice ride since the broker reported its Q2 results, having risen at one point 164% in a month and a half. During this quarter, backing out non-recurring expenses, the reported EPS of $0.12 would have risen to around $0.20. On the other hand, revenues in Q3 were assisted by retail RPM remaining well above GAIN’s target average. For Q4 and 2014, share and profit growth will depend on how much of GFT’s business GAIN can capture, as well as the GTX unit continuing to acquire new customers. In terms of GFT, I believe we will quickly see how well the combined firms are operating, as October volumes expected to be released within the next two weeks, and Q4 results will include financials for the combined firms. Stock-wise, at around $11 a share, the market appears to be factoring minimal earnings accretion for the combined firms, as even without GFT, 2013 EPS is expected to be around $0.80 to $0.85. Therefore, even before Q4 results are issued, we could see shares re-testing their highs if monthly volume figures indicate that GAIN is retaining the bulk of GFT’s business. Is $121 a lot? Sounds rather low to me.. Its like 2.4 pip per trade (turn). I would have thought that with a b-book you would make a lot more than that. Sounds like they are leaving a lot on the table then..
Well their average spreads are under 2 pips, so they did make more than the spread. If you look at IG Markets for example, they report trading profits of ~40% of customer deposits(with deposits being more or less stable yoy). I don’t think they release a RPM metric, but it has to be several orders of magnitude more than $121.